When it comes to school snacks, parents and kids sometimes battle over choices. Kids want fun, sweeter options. Parents want choices that are good for the kids. What is the solution? YumEarth has a fruit snacks that solve the debate. 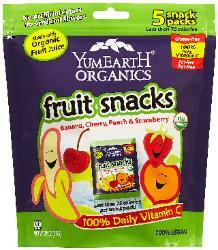 YumEarth fruit snacks are made with real fruit extracts and planet friendly ingredients. Each package contains 100% of a child's vitamin C requirement. It is nut free, fat free, gluten free and 100% vegan. Kids enjoy YumEarth because the flavors are yummy. With options like banana, cherry peach and strawberry, these fruit snacks have identifiable flavors (not mystery mixed fruit flavor). Kids are excited to eat these special treats. Parents approve of these fruit snacks because they are made with organic fruit juice. With ingredients that a parent can identify and understand, I feel better about giving my child these fruit snacks. With so many allergy concerns in schools today, the YumEarth brand helps parents battle the school approved lists. Since these fruit snacks are free of many common allergens, the YumEarth snacks make a great choice to bring to school. YumEarth can be purchased at a variety of retailers including. A multi-serving bag of fruit snacks (5 in a package) retails for approximately $3.99. Would you like to try some YumEarth fruit snacks? Please use the Rafflecopter to enter. Disclosure: I received these fruit snacks to review. All opinions are my own. My boys love apple slices. String cheese is their favorite! My child likes plum sweets. My daughter loves mandarin oranges. Raisins, fruit snacks & string cheese! My daughter loves the individual packs of mandarin oranges.